D.A.R.C’s 90th Anniversary Lunch @ The Old Dutch Club. This annual amateur radio event was started in Scotland by John Forsyth, GM4OOU, and the late Mike Dalrymple (GM4SUC), both members of Ayr Amateur Radio Group (AARG). Through the years the event has grown probably far beyond what was envisaged for it. The event evolved from the Scottish Northern Lighthouses Award Weekend; a biennial event which was first held in 1993 and became the ILLW in 1998. Over the years it has continued to grow and to date more than 450 Lighthouses and Lightships in some 50 countries around the world are participating in the event each year. The event is usually held on the 3rd full weekend in August starting at 0001 UTC on Saturday and finishing at 2359 UTC on Sunday. It also coincides with the International Lighthouse Heritage Weekend an event organised by the Association of Lighthouse Keepers whereby many world lighthouses are open to the public for either the Saturday, Sunday or the whole weekend with tours, entertainment and functions for visitors. The basic objective of the event is to promote public awareness of Lighthouses and Lightships and their need for preservation and restoration, and at the same time to promote amateur radio and to foster International goodwill. Lighthouses are fast becoming an endangered species with the introduction of Global Positioning Systems (GPS) and Satellite Navigation (SatNav). Furthermore the automation of the light source to solar power has resulted in the withdrawal of management personnel (Keepers). Now in it’s 18th year, the ILLW has over 200 entries for this years event that took place on the 14th and 15th August. 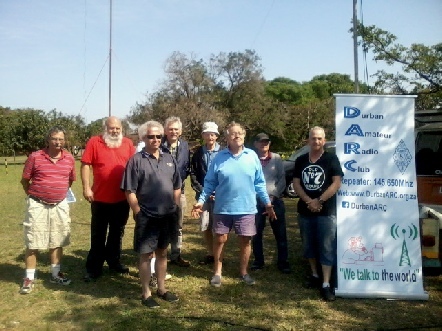 D.A.R.C operating as ZS5D activated the Cooper lighthouse to celebrate the International lighthouse weekend on the 14/15 August 2015. This was done on an open spot in the Wentworth Hospital grounds, QRV was from about 10:00 onwards on 40M – 7070Khz LSB.